Interleaved 2 of 5 is a high density variable length numeric only symbology that encodes digit pairs in an interleaved manner. The odd position digits are encoded in the bars and the even position digits are encoded in the spaces. Because of this, I 2 of 5 barcodes must consist of an even number of digits. Also, because partial scans of I 2 of 5 barcodes have a slight chance of being decoded as a valid (but shorter) barcode, readers are usually set to read a fixed (even) number of digits when reading I 2 of 5 symbols. 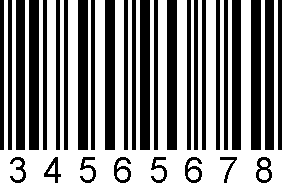 The number of digits are usually pre-defined for a particular application and all readers used in the application are programmed to only accept I 2 of 5 barcodes of the chosen length. Shorter data can be left padded with zeros to fit the proper length. Interleaved 2 of 5 optionally allows for a weighted modulo 10 check character for special situations where data security is important.